This is a rectangular Whizzer Authorized Dealer porcelain sign. This particular Whizzer Authorized Dealer sign is yellow with red and black text. 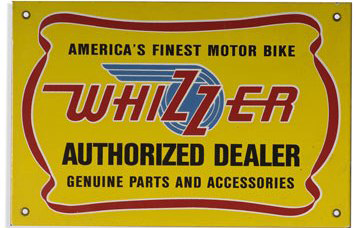 It reads, “America’s Finest Motor Bike, Whizzer Authorized Dealer, Genuine Parts and Accessories” and features a blue spinning wheel in the center of the sign.